Dr. Boggs will review any current vision problems, your general health, as well as discuss your hobbies and lifestyle requirements to better tailor the examination to your needs. In addition to determining your prescription, or how well you see up close and far away, your eye examination will also check to make sure your eyes are healthy. Dr. Boggs will test your color vision, depth perception, as well as check for any early indicators of possible eye disorders, such as cataracts, retinal problems and glaucoma. Ultimately, the elements of your exam will be determined by the doctor. Dr. Boggs will ask these questions during the portion of the examination when your prescription is established. 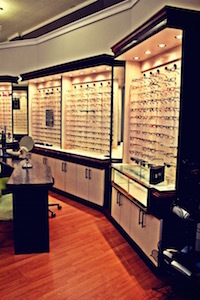 Dr. Boggs will ask you to compare a series of lenses to determine which is clearer for you. As the differences become less noticeable, Dr. Boggs will be closer to finalizing your prescription. For this reason, if you're having a hard time choosing between the options, it's a good thing! This test is used to determine how your pupils and eye muscles react and is important in assessing neurological function. Dr. Boggs dilates nearly all of her patients to check the health of the eye. If there is a reason that she should not, she will make this decision during your exam. The dilation is painless process similar to opening a door so Dr. Boggs can fully exam the retina. Dilation can also help detect diseases like diabetes, high blood pressure and macular degeneration as well as retinal tears, holes and detachments.